Click on map to enlarge text. 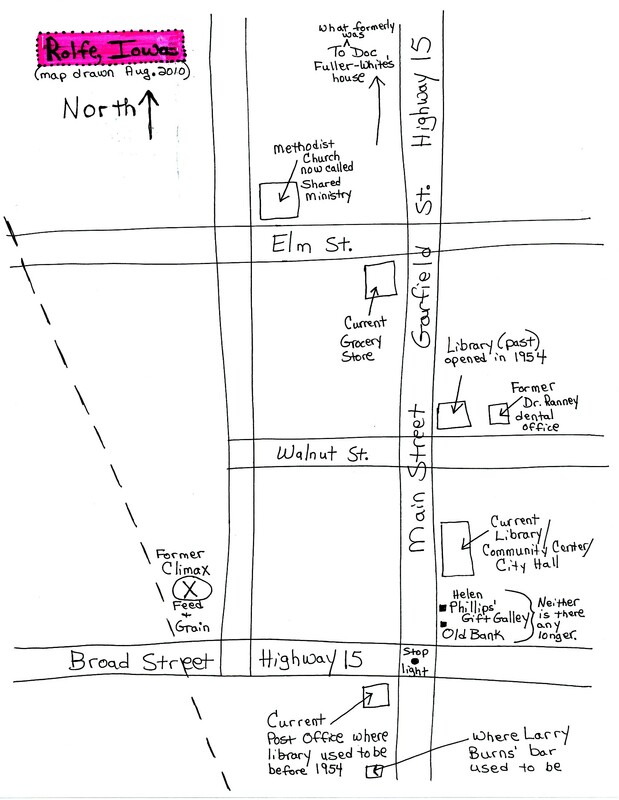 During this third segment, Sharon mentioned locations in Rolfe indicated on the map to the left. Before talking with Sharon, I didn’t realize there had been a public library in the location where the post office now stands. 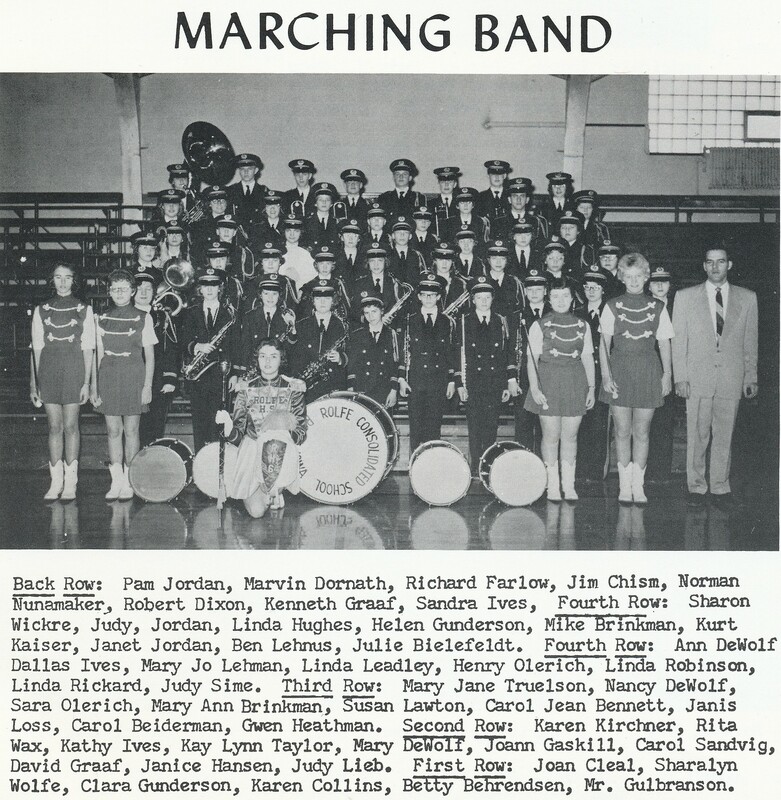 Sharon also recalled band uniforms. I don’t know if the band uniforms in the photos below were the same that she mentioned; if they weren’t, surely they were similar. The photo immediately below is actually two merged photos of the concert band from the 1960 The Ram, the official yearbook of the then Rolfe Consolidated School, Rolfe, Iowa. Notice that in the second photo (from the same yearbook), on the drum it says “Rolfe Consolidated School”…not “Rolfe Community School” which is what we called it when I was in high school in the ’70s. LEFT SIDE of the above photo — Back Row: Mr. Gulbranson, Linda Rickard, Steven Hodoway. Third Row: Susan Lawton, Carol Jean Bennett, Judy Sime, Jim Wilson, Mary Jane Truelson, Pam Jordan. Second Row: Joann Gaskill, Karen Kirchner, Rita Wax, Dallas Ives, Sara Olerich, Mary Ann Brinkman. First Row: Sandra Ives, Janice Hansen, Janis Loss, Judy Lieb, David Graaf. RIGHT SIDE of the above photo: Back Row: Judy Jordan, Richard Farlow, Henry Olerich, Kenneth Graaf, Robert Dixon, Marvin Dornath, Linda Leadley, Bruce Beckord, Linda Robinson, Joann Loss, Mary DeWolf. Second Row: Nancy DeWolf, Sharon Wickre, Linda Hughes, Mike Brinkman, Janet Jordan, Helen Gunderson, Ben Lehnus, Rachel Heald. First Row: Mary Jo Lehman, Gwen Heathman, Carol Biedermann, Carol Sandvig, Clara Gunderson, Julie Bielefeldt. In case you missed them, the first audio segment (9 1/2 minutes) and second audio segment (7 minutes) were posted with accompanying photos in July. If you got all engrossed in the band photos and forgot to click on the link in the first paragraph (for the third segment), I hope you’ll listen to it now or sometime when you have 6 1/2 free minutes. This entry was posted on August 7, 2010 at 1:08 am and is filed under Uncategorized. You can follow any responses to this entry through the RSS 2.0 feed. You can skip to the end and leave a response. Pinging is currently not allowed.